The multiplex ligation-dependent probe amplification (MLPA) technique provides the means for the quantitative analysis of various changes in gene structure and gene copy number of a large number (40-50) of DNA target sequences in a single reaction. Conventional PCR-based methods for mutation detection such as denaturing highperformance liquid chromatography (dHPLC) and sequencing are not able to detect most exon deletions and duplications because the normal allele that is present is also exponentially amplified. MLPA requires a minimum of only 20 ng human chromosomal DNA and can discriminate sequences differing by a single nucleotide. In MLPA, binary probes containing a sequence-specific part and a universal part are hybridized to their DNA targets and ligated. Each ligated probe is then PCR amplified with a universal primer pair and gives rise to an amplification product of unique size. The relative amount of each amplification product reflects the amount of the target sequence that is present in the nucleic acid sample. 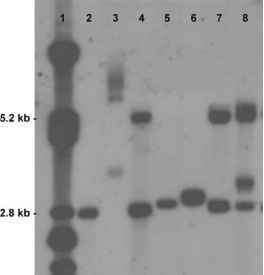 As the sequence detected by the probe is only around 60 nt, MLPA is able to detect copy number changes of single exons. The necessary equipment used in MLPA, a thermocycler with a heated lid and a high-resolution electrophoresis apparatus with fluorescent detection, is available in most molecular biology laboratories.